When I see blackberries, I’m transported back to a specific point in time. I have such fond memories of sitting at my grandmother’s table eating blackberry cobbler after a day of blackberry picking. My grandmother grew up in a tiny community in north Mississippi where wild blackberries were plentiful. If you’ve ever been blackberry picking in Mississippi, you can rest assured that you’ll come home with a haul of berries, but there’s a real good chance you’ll also bring home some critters called chiggers. These little boogers are the larvae form of a certain type of mite and the damage they inflict keeps you scratching for days. My grandmother was a great cook, and one of her specialties was blackberry cobbler. Long after the cobbler was gone, though, we’d enjoy her famous blackberry jelly all year long. I wish that I had spent more time in the kitchen with her and collected her recipes, particularly for cobbler before she passed away. She produced the most delicious, buttery and flaky crust that I’ve ever eaten. Those days have passed, and now I have easy access to berries this time of year without playing host to our little arachnid friends. All the deliciousness with no scratching required! I couldn’t resist picking up some of these beautiful berries this week. 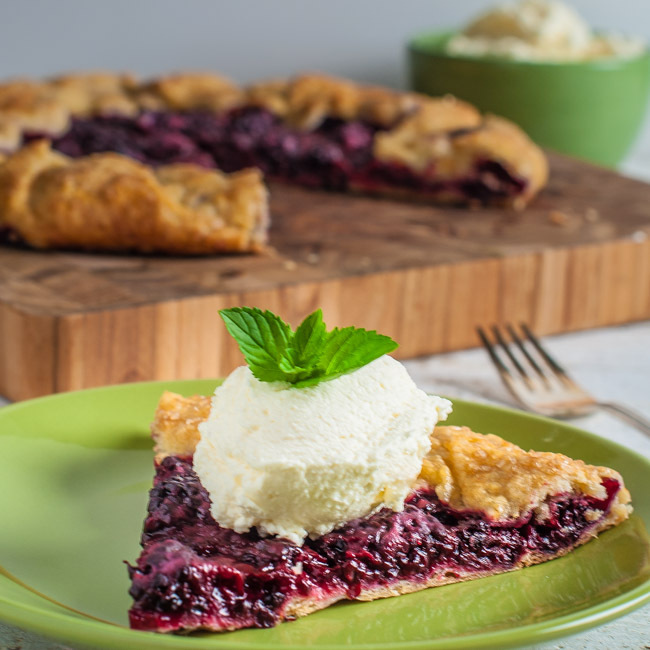 For today’s post, I made a rustic blackberry galette and for a little extra “sump’n sump’n”, I whipped up a little mascarpone cream to top it off. 1. Cut the butter into 1/2 inch cubes and place in freezer for 15 minutes. 2. Mix flour, sugar, and salt in a small bowl and place in the freezer for 15 minutes. 3. Place flour mixture in the bowl of a food processor. Add cold butter to flour mixture and pulse several times until mixture resembles coarse meal. Some larger pieces of butter are okay. 4. Add one tablespoon of ice water at a time to the flour, pulsing after each addition. Dough is ready when it forms a clump when pressed together in your hand. 5. Transfer dough to a floured surface and knead two or three times. Form dough into a four inch disk and wrap in plastic wrap. Refrigerate for 30 minutes. Gently mix all ingredients together, being careful not to mash the berries. Whip cream, sugar, and vanilla extract together until it beings to thicken. Add mascarpone and continue whipping until thick and creamy. 1. Preheat oven to 400 degrees. Prepare baking sheet covered with parchment paper. 2. Roll dough out to a 15 to 16 inch circle on a well-floured surface. Roll dough onto rolling pin and transfer to baking sheet. 3. Transfer blackberry mixture to the middle of the dough leaving a two to three inch border. Fold dough over the edge of the blackberries. Brush egg wash on dough and sprinkle coarse sugar. 4. Bake for 40 to 50 minutes or until crust is golden brown. Cool completely and serve with mascarpone cream. Now I need to go find some more blackberries! I want to make this Galette! I just made a jar of blackberry jam today, but now I’m wishing I had made this instead. Lovely galette Bill! And yes, I do remember picking wild blackberries as a kid. The best blackberries I’ve ever had! This is gorgeous and so delicious Bill! The crust looks amazing! Your blackberry galette screams of summer — just gorgeous and I like that you have not over-sweetened it. Fruit is powerfully sweet to begin with and I appreciate recipes that allow the natural properties of food to shine through. How neat that you made your own mascarpone cream. We enjoy the cheese but I never thought to convert it into a cream like this. Lovely dessert topping idea. What an amazing looking galette Bill! Looks like the perfect proportion of berries to crust. Ever since I first tried mascarpone cream, I want to put it on everything! Wow, what a great recipe! I make blackberry cobbler from time to time (wonderful dish!) but rarely a galette or tart. And blackberries are on sale this week! And I don’t have to fight the chiggers to get them. 😉 Good stuff — thanks. OMG this is seriously one gorgeous galette! Wowza! I think you just transported me to your grandmother’s kitchen table. Would love to have been there. Beautiful galette. And a perfect topping! I often refer to galettes as “lazy pies”. I do love them, especially with a buttery and tender pastry. We love blackberries, but am so glad that olallieberries are what grows in my neck of the woods. Either way, vanilla bean ice cream and a galette is surely a winning dessert! I love how food triggers memories. 🙂 This galette look yummy! Thanks, Tina! So glad you dropped by! Bill, this is a lovely recipe – love all the fresh summer fruits and blackberries are an especial treat! I appreciate that, Donalyn! Thanks for dropping by!